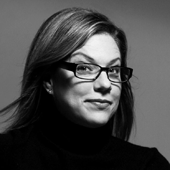 Alina Wheeler works with leaders to accelerate brand clarity, awareness and loyalty. Her disciplined process has been used successfully by large organizations like Vanguard, and non-profit organizations like Thomas Jefferson's Poplar Forest. She is the author of Designing Brand Identity: An Essential Guide for the Whole Branding Team, which deconstructs the branding process into a disciplined five-phase methodology. The third edition is published in seven languages, and is used as a resource by universities, design and branding firms, entrepreneurs and corporate marketing departments. In this audio interview with Debbie Millman, Alina Wheeler discusses branding, her father (who was a sea captain), strategic imagination, color coding souls, the Gap logo fiasco, how hard it is to be a client — and her new book, co-authored with Joel Katz, Brand Atlas. Thanks for the listen, Debbie, Alina. I'm looking forward to reading the new book. Good Insights. Your questions help reveal the right answers. Thanks for the great listen! I share the sentiments on clarity entirely. This is a wonderful interview. Thank you. Thank you for this excellent interview. It was an interesting conversation that I enjoyed very much.